As time curls through the decades, many a new hairstyle rides the wave of popularity. Let’s take a look at which tresses have gone out with ‘bangs’ and which have gained a new volume of devotees! 10. Curly Mullet. In this 80s, this radical cut was a ‘perm-anent’ favorite! 9. Louise Brooks Bob. This eponymous 1920s cut was made iconic by the singer and actress who wore it so unflappably well. 8. Flock of Seagulls. Pioneered by Mike Score of this ‘dos namesake band, this super fly 1980s style was typically a guys’ cut, but was worn by fearsome females as well. 7. Bouffant. Popular in the ’60s, this hairspray-happy hairdo featured tresses puffed up high atop of the head and hanging down straight on the sides. 6. Afro. Reaching the biggest volume of fans in the mid to late ’60s, this groovy hairstyle was a top pick among men and women alike, as well as among noted musical groups like The Jackson 5. 5. Feathered Hair. All the most bodacious birds of the ’80s, like Farrah Fawcett, wore their hair in this flipped, feminine style. 4. Finger Waves. As a rule of thumb, these tight ripples were a mainstay of ’20s and ’30s hairstyles. 3. Poodle Hairstyle. When it came to 1950’s hair fashions, this pretty little style, often seen on Lucille Ball, was top dog. 2. Beehive. In the ’60s, everyone was abuzz about this daring ‘do, which featured hair piled impossibly high upon the head. 1. Victory Rolls. This 1940’s hairstyle, particularly popular during wartime, met women’s needs for practicality in the workforce, yet didn’t sacrifice their femininity. Oh sh*t # 8 is AWESOME…i have seen that look in some 80’s movies but never before on an actual real person! too great! some one needs to rock that style again! Oooh, I love #9, 5, 4 and 1! I’ve always secretly wanted a Louise Brook bob, but I probably never will since my face is a perfect oval, plus since I look like the female version of my older brother I’d probably look identical to him if I cut my hair short! I alwaaaaays refer to that exact same Louise Brooks photo for inspiration and also as a style guide (when I was sporting the pageboy bob), but one that I’ve always desired and never acquired is the Marcel Wave (or the “Finger Wave” as you called it here). 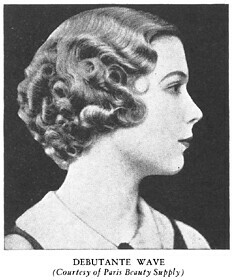 The Marcel Wave apparently took HOURS to prepare and so is not an easy look in today’s fast-paced society. Oh well, c’est la vie…. My mother rocked the blonde Farrah hair (5) back in the 80s when she was a teen, normally I don’t like 80s hair but hers was fab! For me I love the finger curls (4, I adore this picture http://farm4.static.flickr.com/3525/3191101530_d5fbce047c.jpg) and 9. And who wouldn’t love 1940s hair? I love number one, i think it just looks so classy, it’s elegant and sophisticated. I also like number five, i adore 70’s styles, clothes, hair, hippy lifestyle, it’s great! It’s funny how some of the styles look very dated and some of the styles seem to be timeless. Victory rolls are THE BOMB! With the exception of #6 (Afro), I have tried everything else for theme parties, Halloween, etc. So much fun! i actually have my hair cut like #9 but slightly longer. I am currently rocking the Brooks Bob, but if I ever let my hair grow out again I’d go for the victory rolls! If I wasn’t an Irish lass with fine red hair to match, I’d rock a 70’s afro. I love the power it connotes. I’m growing my hair at the moment, and secretly its because I want to recreate Farrah’s hair in #5. It just looks so pretty, yet she still has that ‘I’ve just been running with the boys’ style about her. Number 1 is the best. My Mom and I always do it for WWII reenactments. I’ve always wondered how the stylists accomplished the extremely complicated hairstyles that you see in forties movies. They never come close in period movies today today! And of course, the finger waves are amazing. One day I’m going to HAVE to try them. Modlife should do a tutorial on how to do Victory Rolls because I love them insanely, but I have no idea how to do them! UHHHH, if only I had the means.